The true classic wool athletic sock in a heavy weight.Wigwam Husky Crew Sock dispels the common myth that wool is only beneficial in cold weather. The experts will tell you that wool keeps your feet dry and comfortable across a wide range of temperatures and activities. 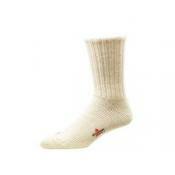 This is a truly classic crew length wool sport sock in a heavy weight. 2x1 true rib leg and smooth loop toe seam add to the pure comfort of this wonderful sock.